The life raft winch type WT15 is included in the life-saving equipment installed on board the sea-going vessels and is intended for launching of completely equipped life rafts occupied by a maximum of 16 people. The life raft winch type WT15 is adopted for remote control of winch brake from inside of the launched life raft. The life raft winch type WT 23 is included in the life-saving equipment installed on board the sea-going vessels and is intended for launching of completely equipped life rafts occupied by a maximum of 25 people. The life raft winch type WT 23 is adopted for remote control of winch brake from inside of the launched life raft. The rescue boat winch type WL13 is included in the rescue equipment installed on board the sea-going vessels and is intended for launching and recovery of equipped rescue boat occupied by set of 6 people. The rescue boat winch type WL13 is adopted for remote control of winch brake from inside of the launched rescue boat. The boat-raft winch type WLT12/23 is included in the rescue equipment installed on board the sea-going vessels and is intended for launching and recovery of equipped rescue boat occupied by set of 6 people and for lunching of completely equipped life rafts occupied by a maximum of 25 people. The boat-raft winch type WLT12/23 is adopted for remote control of winch brake from inside of the launched rescue boat and life raft. 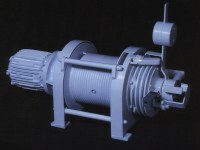 The boat-raft winch with electric supply 3x380 V, 50 Hz, (35) of the right hand execution (P): WLT12/23-35P.